About the author: Helge Goessling is a scientist at the Alfred Wegener Institute, Helmholtz Centre for Polar and Marine Research in Bremerhaven, Germany, specialised in climate modelling and sea-ice forecasting. Since 2014 he has been the Director of the International Coordination Office for Polar Prediction, coordinating research activities for the Year of Polar Prediction (YOPP). As a welcome to the new dialogue platform Polar Prediction Matters, Helge shares his personal view on how to foster the dialogue between forecast users and providers. 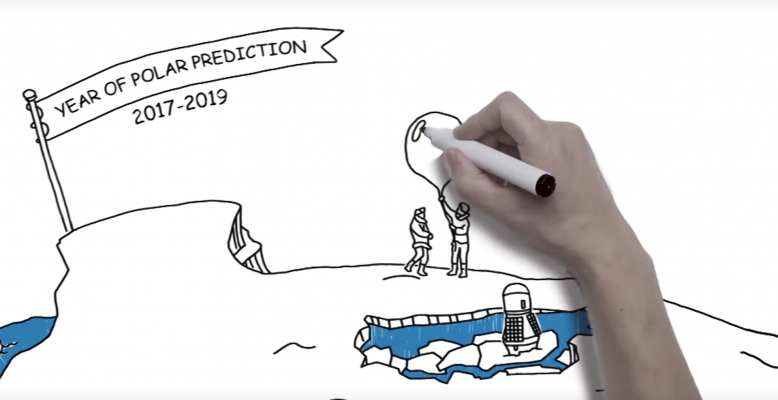 The Year of Polar Prediction (YOPP), initiated to enable a significant improvement in environmental prediction capabilities for the polar regions and beyond, currently brings a lot of attention to polar forecasting. A crucial element of YOPP is to better understand what really matters at the end of the forecast chain to those operating in polar regions. An important part of my work, both as a scientist trying to improve sea-ice forecasts and as YOPP coordinator, is to attend diverse scientific meetings, workshops, and conferences across the globe. Some of these gatherings greatly benefit from the participation of people that use, or would like to use, polar environmental forecasts to guide decisions in thei­­r routine work and life: the captain of a vessel navigating polar waters, the pilot of an aircraft operating in Antarctica, or other people living or working in harsh polar environments. The insights they convey to us (the typically scientist-dominated audience), through presentations or during discussions, sharpens our view on what really matters at the end of the forecast chain: What are the environmental characteristics that make a difference to their decisions? How much are they affected by storms, fog, rime, freezing rain, waves, or sea-ice conditions like ice-edge location, drift, and pressure? How long in advance, and at what accuracy, do they need the forecasts? Are they able (and willing) to make effective use of uncertainty information that comes with probabilistic forecasts? What are the most useful products currently available to them, and do they have particular needs for improved or additional products? It is a real pity that each time when such a valuable view on the use of environmental forecasts is provided by someone operating in polar regions the associated knowledge gain is restricted to a relatively small audience, such as the participants of a specific meeting. This perception sparked the idea to collect and share individual insights by forecast users through an online format that we entitled Polar Prediction Matters (PPM). Furthermore we (see below who exactly “we” are) decided that the user perspectives should be complemented with contributions by “providers”, such as natural scientists working at meteorological and sea-ice services and at universities, but also by social scientists trying to shed light on how forecast information and products are created, delivered, and utilised. 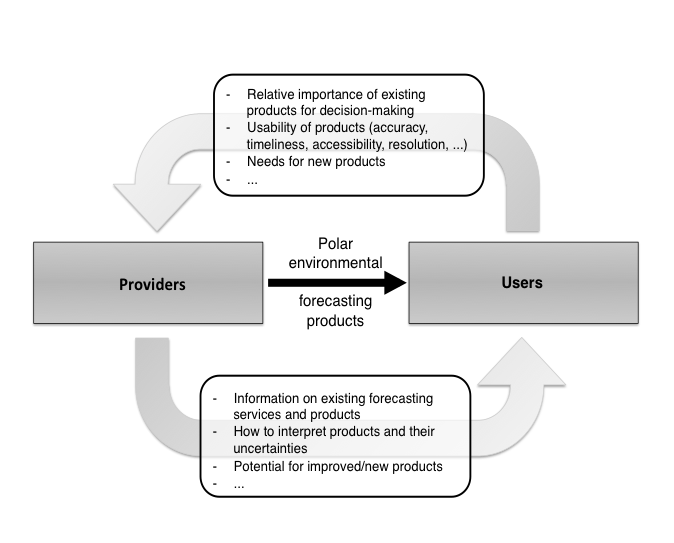 We envisage that Polar Prediction Matters will foster the dialogue between forecast users and providers (see Figure). The information flows between polar forecast providers (forecasters and academic researchers) and users who base decisions on forecasts. The basic process is the mere delivery of forecast products from providers to users (central arrow). However, this central element needs to be supplemented with additional communication in both directions – a dialogue: The requirements of various users need to be communicated to, and understood by, the providers (upper branch) so forecast systems and products can be designed to meet actual user needs. In reverse, polar forecast users need to be instructed on what forecast products exist, how a forecast product must be interpreted, what the associated uncertainties are, and what the potential for improvements and/or new forecast products are (lower branch). PPM has been initiated as a means to foster this dialogue. While each individual contribution to PPM will reflect individual needs and insights, our hope is that, collectively, these perspectives will provide a basis for a better understanding of actual user needs. PPM will thus help the Year of Polar Prediction initiative to guide research towards significantly improved and applied polar prediction capabilities, in a way that is meaningful to the various stakeholder groups involved. 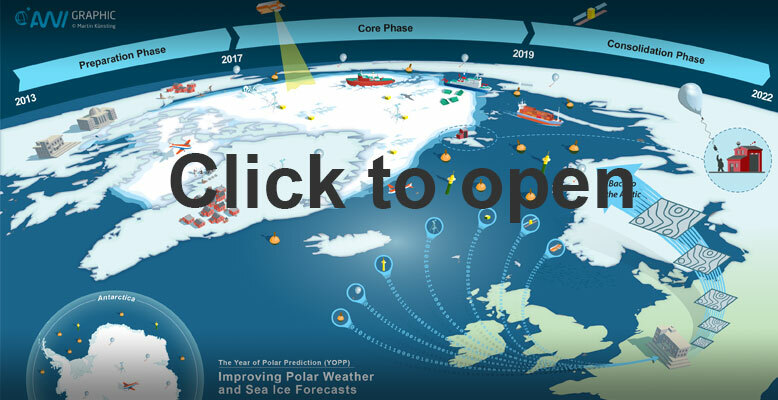 Over the course of the YOPP Core Phase from mid-2017 through mid-2019, PPM will feature written contributions on polar environmental forecasts and how these are used. In order to foster open communication and a vivid exchange of views in relation to the individual contributions, we invite PPM readers to ask qustions and discuss the contributions online by posting comments. Another important detail is that we will make sure that all contributions to PPM will remain publicly available beyond the conclusion of YOPP. I would like to thank all authors in advance for contributing to Polar Prediction Matters, and I wish every reader to gain some interesting new insights. For my part, I am very much looking forward to widen my own horizons over the coming two years. What is the Year of Polar Prediction? PPM is a contribution to the Year of Polar Prediction (YOPP) – an initiative of the World Meteorological Organization (WMO) Polar Prediction Project (PPP) with a Core Phase from mid-2017 to mid-2019. 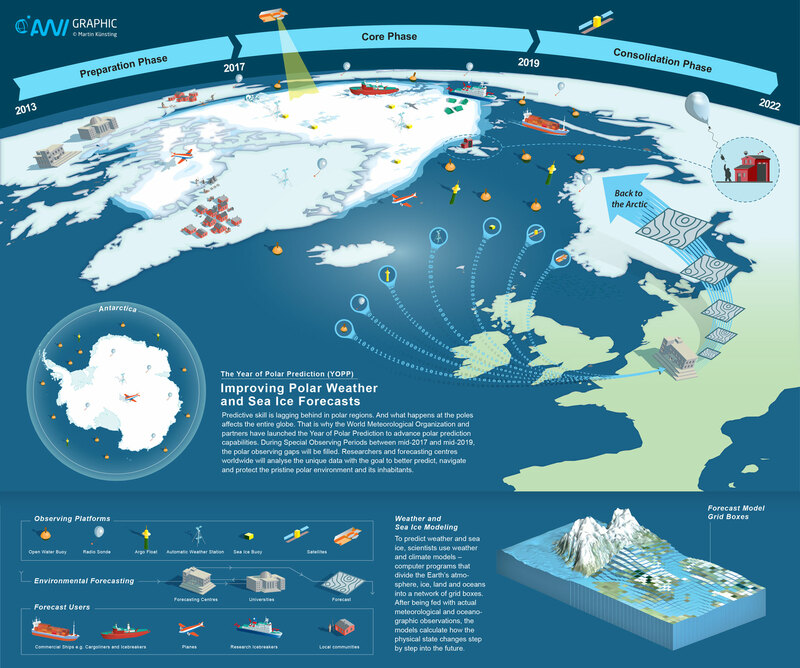 The YOPP mission is to ‘enable a significant improvement in environmental prediction capabilities for the polar regions and beyond, on time scales from hours to seasons, by coordinating a period of intensive observing, modelling, prediction, verification, user-engagement and education activities’. The scope of YOPP goes significantly beyond classic weather forecasting and includes, in particular, sea-ice forecasting and the incorporation of seasonal time scales. A subcommittee on Societal and Economic Research and Applications (PPP-SERA) has been established to foster the user engagement component of YOPP. Detailed information on the various elements of YOPP can be obtained from http://www.polarprediction.net. Who is behind Polar Prediction Matters? PPM has been initiated and is maintained by the YOPP Coordination Office (http://www.polarprediction.net/background/ico/, supported by the Helmholtz Earth System Knowledge Platform: http://www.eskp.de), the PPP-SERA subcommittee (http://www.polarprediction.net/yopp/yopp-task-teams/ppp-sera/), and the EU-funded Horizon 2020 research consortia APPLICATE (Advanced Prediction in Polar regions and beyond: modelling, observing system design and Linkages associated with a Changing Arctic climaTE: http://applicate.eu) and Blue-Action (http://blueaction.eu). For any questions related to YOPP and PPM, please contact office@polarprediction.net.